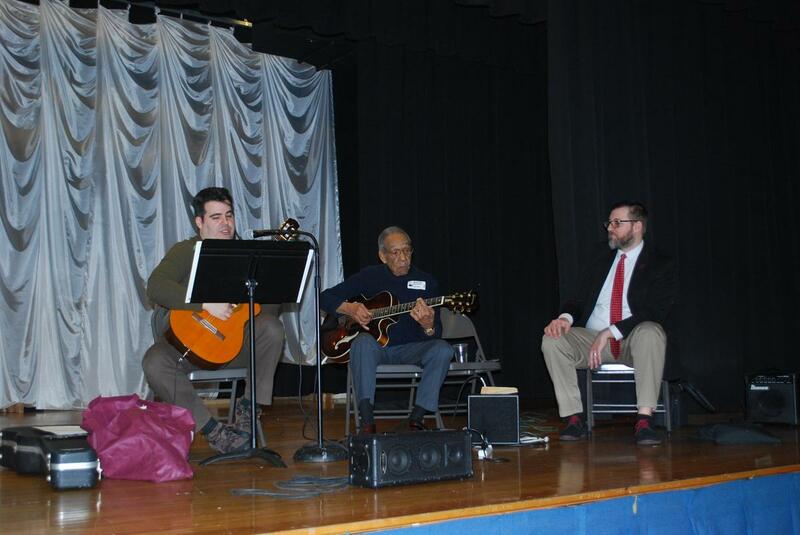 Students at Jose Marti Freshman Academy recently received a personal, first-hand account of the Civil Rights movement – along with an introduction to the roots of American jazz music – when legendary New Orleans guitarist Warren Battiste performed at the school. Mr. Battiste, who met iconic jazz figures Louie Armstrong and Duke Ellington when they visited his home in New Orleans when he was a child to play with his musician father, is a recipient of the prestigious Lifetime Achievement Award from the New Orleans Jazz & Heritage Festival. He is also a survivor of Hurricane Katrina who spent two days on an Interstate overpass with no food or water before being rescued. His life, according to School Principal Rudy Baez, is a testament to hard work, fierce determination and freedoms gained through the Civil Rights movement. A friend of Daniel Gurry, a history teacher who spent five summers in New Orleans after Hurricane Katrina struck in 2005, brought Mr. Battiste to the school for the 10th time. Mr. Gurry and Randy Pradera, an English teacher, performed with Mr. Battiste. Mr. Gurry noted that this performance in late January is a great personal introduction to the subjects they will study in February as part of Black History Month. Born in 1925, Mr. Battiste was the first guitarist to play with Fats Domino and he also played in New York City with the legendary Dizzy Gillespie, and next month he will begin a three-month musical engagement in New Orleans.